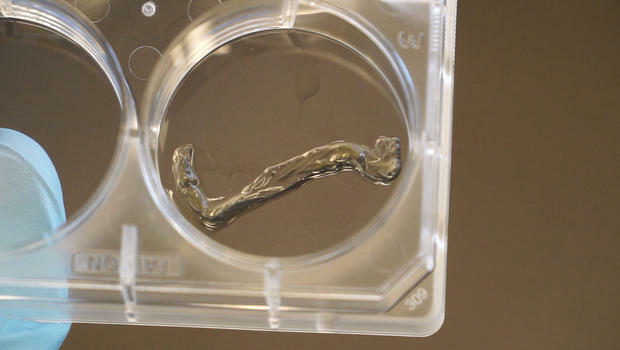 3D printing revolutionizing burn treatment! TORONTO – Dr. Marc Jeschke, the head of one of Canada’s largest burn treatment centers, had to admit the 3D skin printer in his hands didn’t look revolutionary. “I actually find it kind of fish-tanky,” he told CBS News, laughing. But this boxy prototype could change the way burns are treated, from current skin grafting methods Jeschke calls “barbaric” to a process his team believes will be faster, cheaper and easier on the patient, with an end result — functional human skin — promising to be just like the real thing. 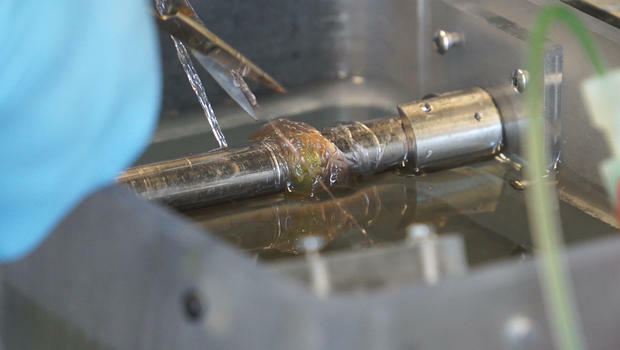 To begin the process of creating new human skinon the printer, Jeschke explained that healthy skin cells are first harvested from the burn patient, then analyzed and multiplied in the lab. It does so via a cartridge, which weaves the cells together with a gel-like matrix serving as the skin’s 3D scaffolding. The cellular tapestry that emerges from the cartridge floats through the printer’s reservoir and gathers around a rotating drum. The strips are then collected and cultured. 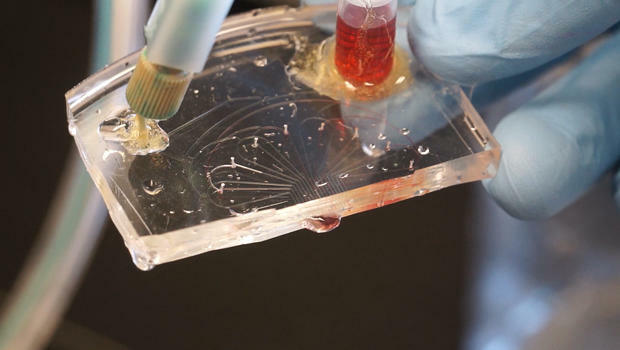 “You basically imprint your various cells into this three-dimensional matrix that comes out and it’s basically ready to be put on the patient,” said Jeschke. The printer is still in preclinical trials, but Jeschke’s team said they hope to move to human trials within two years, and if those go well, printers like these could be in hospitals and helping burn patients within five years. But to get there, Jeschke said the project will need more funding. In September, members of the team were selected as the Canadian winners of the 2014 James Dyson Award, a prestigious international engineering prize that comes with cash, but only a fraction of what it will cost to get the project across the finish line. And there are other questions that still need to be answered. Growing enough cells remains a challenge. “That’s the current issue, which is how to get cells to magnify, multiply and grow in a speed that’s beyond what they normally do,” Jeschke said. Should they succeed, they’ll help change a process Jeschke said is in dire need of an upgrade. Current skin grafts for burn victims require removing a healthy section of a patient’s skin to cover their wound, essentially creating a second wound in the process. The greater percentage of the body that’s burned, the more skin that’s needed — and the less that’s available. Skin removed for these grafts can be expanded, but not by much. With their printer, Jeschke and his team think they can cut that recovery time down significantly. And while other methods can leave patients with skin that doesn’t match their natural color, or lacks follicles or sweat glands, researchers on the project say their method will allow them to eventually add those complex layers of cells. “Someone will be able to take their own cells, and incorporate it into this printer and have skin graft printed that are made especially for them,” said Lian Leng, a PhD student at the the University of Toronto’s Department of Mechanical Engineering and one of the lead developers of the printer, commercially known as the PrintAlive Bioprinter. The printer could have a critical impact in underdeveloped countries, where even a small burn can be fatal. Researchers on the project plan to train doctors in Cambodia to grow cells and operate the printer themselves. Such a device could also provide critical support to soldiers burned on the battlefield. That’s prompting the U.S. military to fund similar projects, like one at Wake Forest University in North Carolina. “You probably can reduce war fatalities significantly if you have an off-the-shelf skin product that can be put on,” said Jeschke. It’s a fish tank, though, that could eventually save lives. ← The Malta Comics Pop Culture Expo 2014!